It’s hard to believe, but Memorial Day is only a week and a half away – which means it’s almost summer! I’m totally that person that could live with one season year-round if it meant that season were summer. 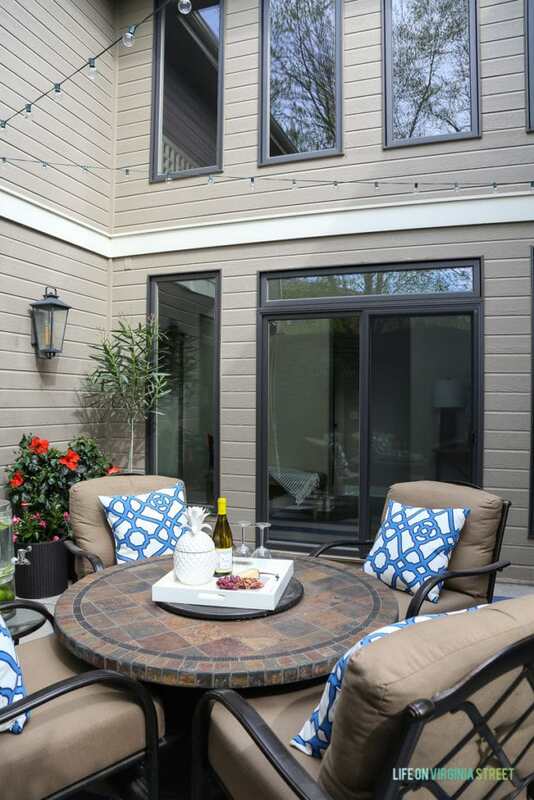 And, in the warmer months, our outdoor spaces are just as important (if not more) than our indoor – and I love to decorate them! One of my favorite ways to freshen things up each spring/summer is to swap out my outdoor pillows. So, today I’m sharing some of my top picks for coastal inspired pillows along with styling ideas from years past! In addition to my pillow picks (sources for all above and more are found towards the end of this post), I’ve teamed up with Satori Design for Living and a group of bloggers all sharing outdoor decor and decorating tips and ideas. You’ll find all of those links at the end of the post. In every outdoor entertaining space we have, I use throw pillows in one capacity or another. Today I’m going to share some of my favorites from year’s past, along with some current products I love! These striped Sunbrella pillows are still a favorite and I plan to use them again this year. I also still really love these trellis pillows in our courtyard! 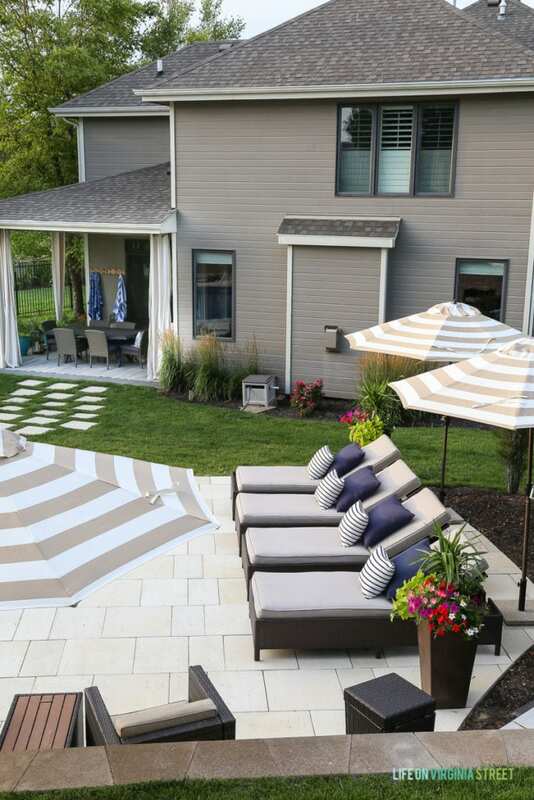 I’ve also loved using solid pillows like I did on our pool deck the first year we opened it! 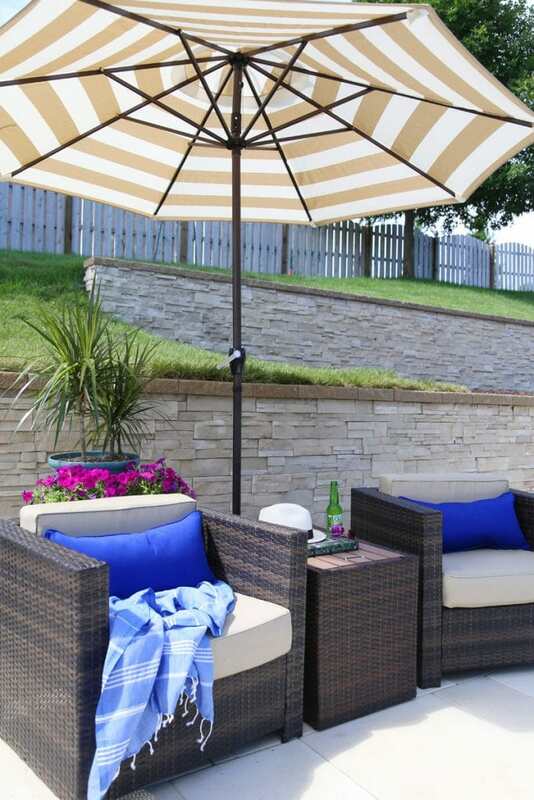 Anything to just add some fun personality to basic outdoor furniture. I find I tend to be a bit more adventurous with patterns and colors outdoors because of the harsh sunlight. 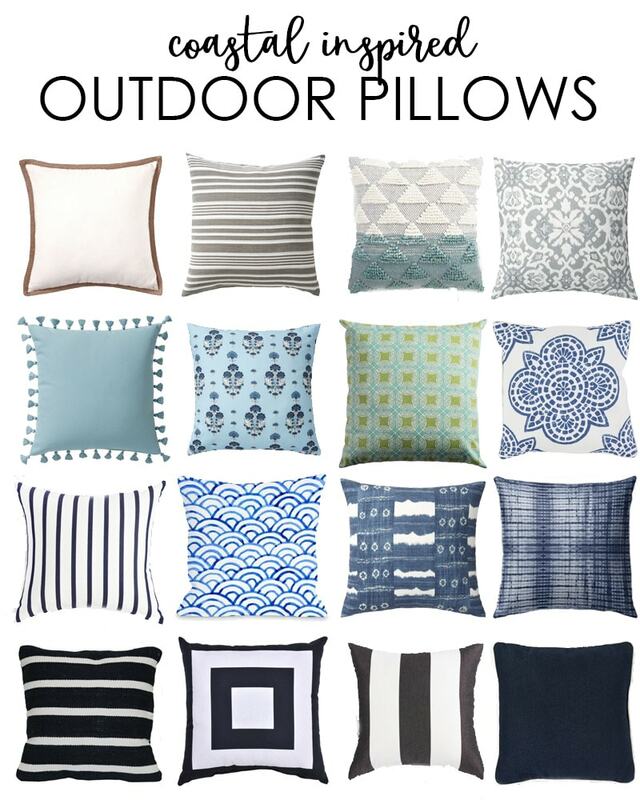 Following are some of my favorite coastal inspired outdoor pillow finds this year! When I say “coastal inspired” I mean pillows that give you that great beachy, boho, coastal vibe, without literal symbols like starfish and waves and sailboats. 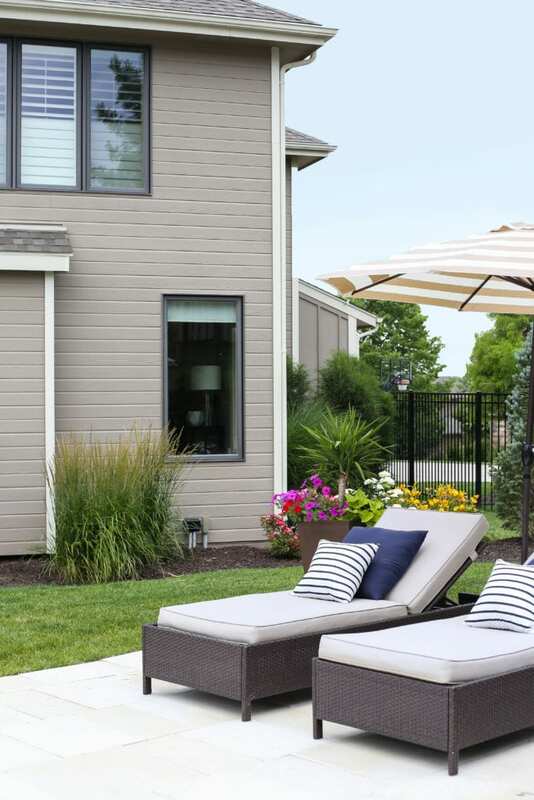 Layered on neutral outdoor furniture, these will all have serene beachy feel! Are you ready for even more outdoor inspiration? Be sure to check out all of the others stops on the tour below! Love your gorgeous pillow choices, Sarah! Give me #alltheblues !! I’m with Krista! Loving all the blue pillow choices. It’s amazing how they really wake up an outdoor space. Oh boy, you really had no way of knowing this… but I’m a recovering pillow addict! But seriously, all of these amazing choices are making me want all of the pillows! I especially LOVE the ones with the little tassels, so cute! I’m really partial to blues & greens…and stripes…does that narrow it down? haha I love your backyard and love following your house painting going on on IG stories, Sarah! I love decorating with blue and these pillows choices for summer are on point! Beautiful selections. Pillows can make a space feel brand new so affordably. Love all your choices.